How would you like to make more and spend a lot less? I already know what the answer will be, so let me tell you about the Real FULL ON Game Changer! As a 100% Organic farmer for the past 47 years, every way to boost my yield while using Beneficial methods to enrich my soil, has had my undivided attention. My Editor sent me a tip about this product that I immediately looked into; his guidance has now given me an advantage over every other grower, till they find this Real Game Changer too! 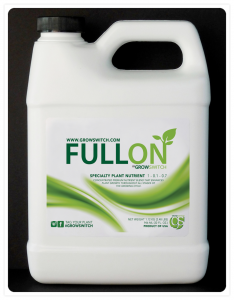 This product, FULL ON, enables the plant to utilize every drop of Nutrient and fertilizer, lessening the amounts needed by up to 60%, while increasing the yield Significantly; and 35-40% More is truly a Significant amount! It is contrary to my ways to start with less of my amendments in the soil, as well as using my “Teas” at half strength. However, this really, really works! The evidence of its working is the Vitality, the Vigor, the over all Healthy growth and deep rich color in the leaves demonstrating how well it is working immediately! For Gardeners who regularly use exotic formulas, costly amendments and fertilizers, the immediate pay back by using half as much, is why to make it the first product you buy for the garden! The reasonable cost of FULL ON, its effectiveness, while saving on nutrients and fertilizers, makes this a No Brainer Game Changer! via FULL ON “Game Changer”.